In just over four miles, this ribbon of concrete travels from ancient Egypt and medieval England to New York, Paris, the tropics and, eventually, modern-day Venice. The travel is easy and free of jet lag. You experience it all through themed hotels. Over the decades, these hotels have gone from simply grand -- think the Stardust Resort and Casino -- to ginormous (MGM Grand, Caesars Palace, Aria Las Vegas). 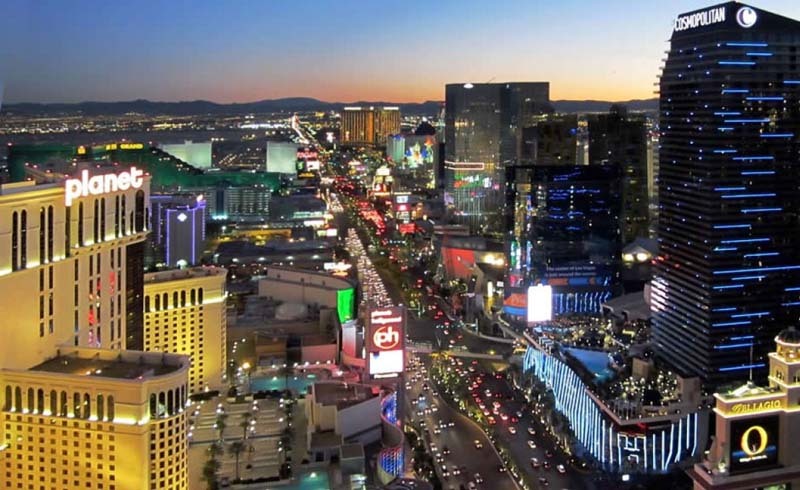 By the end of 2018, 43 properties had a formal Strip address, according to data from the Las Vegas Convention & Visitors Authority. Together these hotels have 86,833 rooms -- more than half of the 149,158 hotel rooms citywide. Most of these places are full-fledged resorts with multiple restaurants, pools, nightclubs, spas, fitness centers and more. Many also have theme park-style attractions. The scene in Las Vegas changes rapidly, and Strip hotels evolve constantly to set themselves apart. 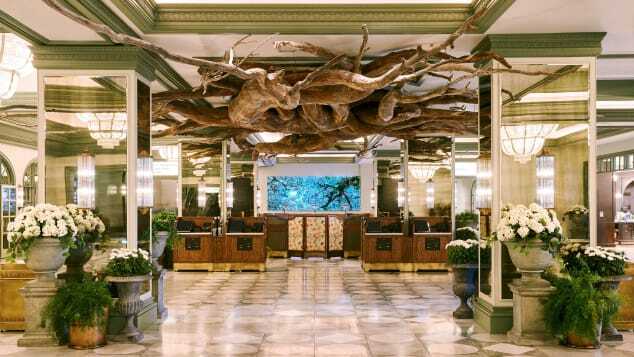 The Park MGM lobby features an art installation resembling tree roots growing from the ceiling. The former Monte Carlo Casino Resort was reborn in December 2018 as Park MGM, a conceptual nod to The Park, an open-air pedestrian mall just to the south. Where once guests were greeted with mirrors and marble, now an art installation in the lobby resembles tree roots coming down from the ceiling. Frescoes on corridor walls depict people frolicking outside. Upstairs, refreshed rooms feature alcove beds and sofa-sized window seats. Perhaps the biggest changes are to the resort's dining scene. Pedestrians now enter the property off the Strip through Eataly Las Vegas, a food hall-style Italian marketplace with a small wine shop, restaurants and stalls selling pastries and gelato like the kind you get in Italy. 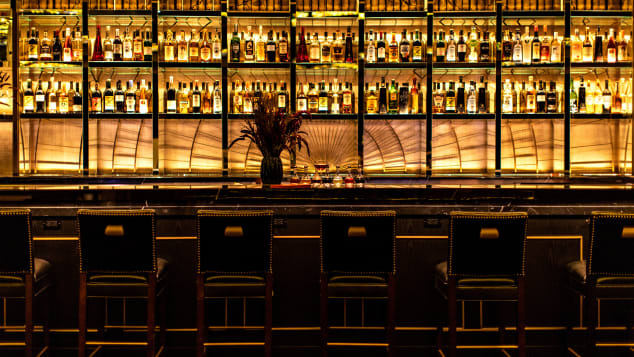 Other notable eateries include Best Friend, a Korean barbecue joint from chef Roi Choi; and Bavette's, a dimly lit steakhouse with red leather banquettes and a speakeasy-style bar in the back. Park MGM even appeals to music lovers. On the Record nightclub has three hidden karaoke rooms, and Lady Gaga is slated to perform a residency at the resort's Park Theater through the end of 2020. 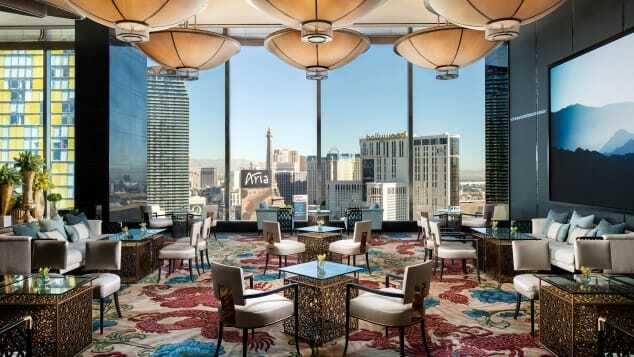 NoMad Las Vegas features its namesake restaurant, overseen by chef Daniel Humm. Hardwood oak floors. Standalone pedestal tubs. Wooden writing desks. Minibars inside of steamer trunks. With elegant touches like these in the 293 guest rooms, the NoMad Las Vegas feels about as un-Vegas as you can get. That's why the high-design hotel's opening in October 2018 was such a big deal. The property occupies the top four floors of the new Park MGM resort at the south end of the Las Vegas Strip, and is the brainchild of the team behind NoMad hotel in New York. 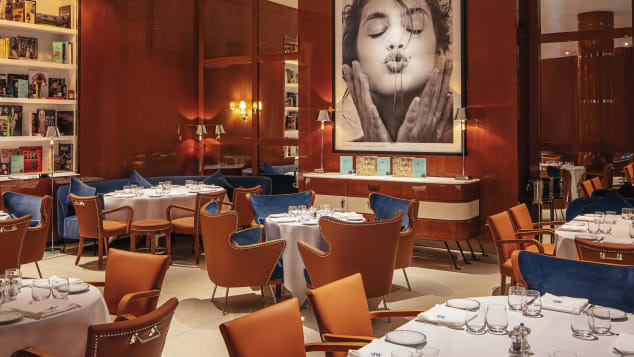 Without question, the hotel's calling card is the NoMad Restaurant, helmed by Eleven Madison Park alum Daniel Humm. The dining room is designed to replicate an old library (with real books! ), and signature dishes such as roast chicken stuffed with foie gras, black truffle and brioche are meant to be shared. 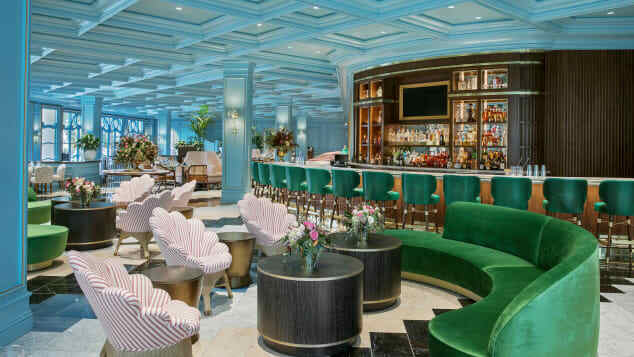 There's also jazz brunch in the NoMad Bar every Sunday from 1030 a.m. to 2:30 p.m.
A swanky rooftop pool exclusively for NoMad guests is expected to open in April 2019. The Venetian's Electra Cocktail Club features the "Penichillin," with Monkey Shoulder Scotch whisky, lemon juice and ginger syrup. 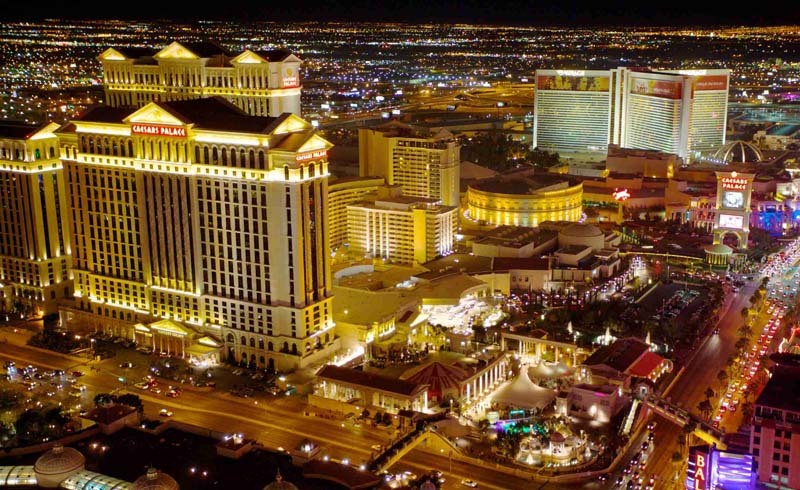 The Venetian and Palazzo hotels unified under The Venetian Resort Las Vegas in early 2019, which means the destination now boasts more than 7,000 rooms in all. The two hotels are connected by a series of shop-lined corridors and canals. Accommodations come standard at roughly 700 square feet -- downright massive in comparison to other hotels. Each suite boasts a sleeping area and a sunken living room. For a resort fee, guests also have access to two pool decks and the Canyon Ranch spa and fitness center. Epicures are abuzz over the Venetian's restaurant scene. Mott 32, the first U.S. outpost of a Hong Kong restaurant by the same name, opened in December 2018, and serves Shanghainese specialties such as Peking duck, which you must order two days in advance. The Factory Kitchen, which opened in early 2019, churns out Italian specialties such as soft cheese-stuffed sweet and spicy peppers, Porchetta, carpaccio and homemade handkerchief egg pasta. Elsewhere in the resort, on the Palazzo casino floor, Electra Cocktail Club pours stiff drinks with a tropical flare. The "Penichillin," with Monkey Shoulder Scotch whisky, lemon juice, ginger syrup, honey syrup and an Islay float, is a winner. The Waldorf Astoria serves afternoon tea in its 23rd-floor lounge. It doesn't have a casino, but the Waldorf Astoria Las Vegas still packs a punch. The hotel raised its current flag in December 2018 after nine years as a Mandarin Oriental. Rooms are modern and luxe, with frosted glass panels that enable guests to look out on the Strip while they relax in the tub. Another innovation: the valet closet, which is accessible from the hallway and enables hotel staff to deliver room service and other amenities without ringing the doorbell. Afternoon tea in the hotel's 23rd-floor lounge is exquisite, and includes a tower of goodies and finger sandwiches, as well as the option for champagne. Elsewhere on the property, the Zen Kitchen restaurant kicked off 2019 with a dim sum menu that includes crispy golden cups with lobster and Wagyu short rib and bone marrow dumplings. If your dogs are barking from walking the Strip, sign up for the zero gravity foot treatment at the Waldorf Astoria Spa. The experience includes foot exfoliation and foot mask, warm steam towel foot wrap, pressure-point massage and acupressure, all performed while you sit in a zero-gravity chair. Sadelle's, an upscale New York-style Jewish deli and restaurant, opened at the Bellagio in 2018. The most iconic of all modern Strip hotels just gets better with age. Standard rooms are dappled with warm color combinations of blue and gold or green and purple (guests can open and close the curtains by pushing buttons near the bed). Higher-end rooms and suites include access to the VIP Chairman's Lounge, which offers lender laptops, multiple daily food presentations and line-cutting passes for The Buffet. The heart of the resort is the Conservatory, where a squadron of more than two-dozen horticulturists maintain elaborate flower displays that change four times each year. Sadelle's, an upscale New York-style Jewish deli and restaurant, opened here in December 2018, and looks out on the beauty. Elsewhere on the property, the Bellagio Gallery of Fine Art continues to ink top-notch artists from around the world. A popular current exhibit features an infinity mirror room from Japanese artist Yayoi Kusama. The installation became a social media sensation overnight, as visitors waited up to 20 minutes to spend 45 seconds inside capturing the perfect Instagram pics. The exhibit originally was supposed to end this spring but recently was extended until June 30. FLY LINQ whisks riders at more than 30 mph 12 stories above a promenade adjacent to the LINQ resort. The Central Strip's biggest experiment continues to evolve. 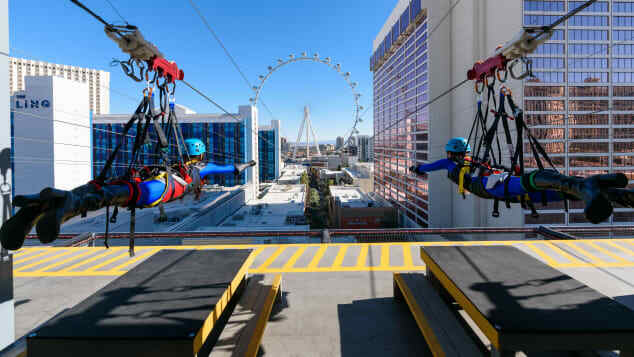 At the end of 2018, the hotel added FLY LINQ, a zipline attraction that whisks riders at more than 30 mph 12 stories above the LINQ Promenade, an open-air shopping district adjacent to the resort. Another major addition: The Strip's first outpost of California's beloved In-N-Out Burger franchise. Unlike just about every other In-N-Out, this one is walk-up only. Nobody comes to the LINQ for the rooms (they're pretty basic), but parent company Caesars Entertainment has turned portions of the casino floor into a laboratory to test what sort of gaming experiences visitors want. An area near the sports book is home to 12 "fan caves" where groups can essentially rent 200-square-foot living rooms for the day. Each cave features an L-shaped couch that seats 10, a 98-inch television that can be split into four screens, an Xbox, virtual reality headsets and games by Oculus. The caves are served by wait staff and have food-and-beverage minimums that range from $100 to $1,500 and vary depending on the day of the week and time of day. The first Las Vegas outpost of New York-based Cipriani restaurant has been attracting a crowd at the Wynn. Judging from crowds on recent visits, this north Strip resort appears to have weathered the sexual harassment scandal surrounding its founder, Steve Wynn, who stepped down as CEO of the parent company in February 2018. Rooms in the Wynn tower are among the swankiest on the Strip, and all accommodations in the Encore tower are suites. The resort offers intimate classes with property chefs and culinary experts teaching in restaurant kitchens. One recent class had master cake artist Flora Aghababyan sharing her expertise on advanced decorating techniques. In a shopping area that opened on the property in late 2018, the first Las Vegas outpost of New York-based Cipriani has been attracting quite a crowd. The bar prides itself on the Bellini, which was created by Italian bartender Giuseppe Cipriani in the 1930s. Finally, golf-lovers breathed a sigh of relief toward the end of 2018 when the resort announced it would reopen the on-site, 130-acre Wynn Golf Club later this year. Known for its waterfalls, the Tom Fazio-designed course was the only one on the Las Vegas Strip. The company had closed it in 2017. 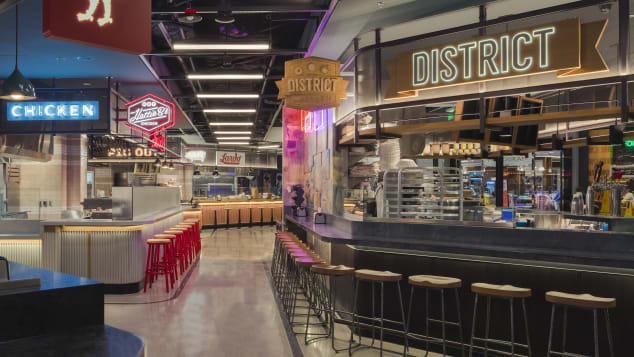 Block 16 offers a Vegas take on the modern food hall. If The Cosmopolitan were a person, it would be a millennial with effortless cool. Exhibit A: Expansive rooms with balconies (seriously -- windows that open!) overlooking the Strip. Exhibit B: A pool deck that transforms into an ice-skating rink in winter and shows movies in summer. Exhibit C: Opium, a hilarious (and R-rated) theatrical show that features sword-swallowing, expert hula-hooping and other feats of derring-do. Another example of the hotel's hipness is Block 16, an urban food hall with stalls peddling cult favorites from around the country. District, from New Orleans, dishes doughnuts the size of a small child's head; Hattie B's Hot Chicken, from Nashville, serves fried chicken and sides such as pimento mac and cheese. 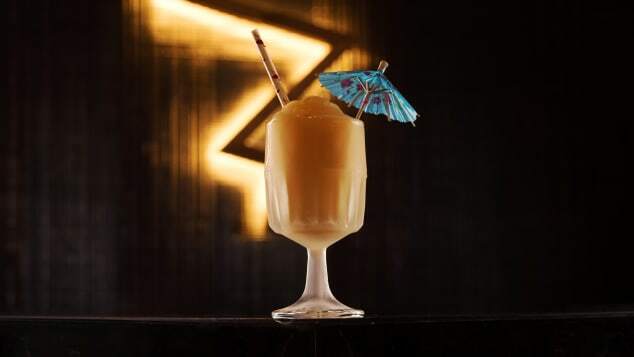 Toward the back of the space, behind the door with a picture of a donkey, an outpost of New York's Ghost Donkey speakeasy specializes in mezcal and tequila drinks. There's also a menu of different nacho plates. In the spring of 2019, Cosmopolitan is expected to open The Barbershop, a working salon with a bar, lounge and clubhouse-style vibe.